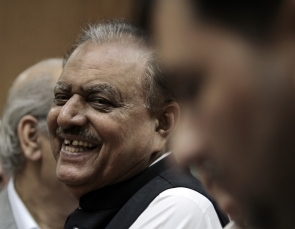 Mamnoon Hussain, the Pakistan Muslim League-Nawaz candidate expected to win Pakistan's presidential election next week, graduated from a seminary, sources said on Thursday. Hussain joined Darul Uloom Naeemia in the port city of Karachi in 1953 and was enrolled for Daras-e-Nizami, the famous centuries-old curriculum steeped in Islamic theology and followed in Pakistani madrassas. "He remained in the madrassa for some years and got a degree in 1955," said one of his close friends and a party colleague, who spoke on condition of anonymity. Hussain on Wednesday filed his nomination papers as the candidate of the ruling PML-N led by Prime Minister Nawaz Sharif. After filing his nominations, Hussain told the media it was a "blessing" that the presidential election is being held in the holy month of Ramzan. He is a practising Muslim and regularly follows the strict Islamic obligation of praying five times a day. Hussain is expected to easily win the presidential poll on July 30 as the PML-N has a clear majority in the electoral college comprising members of parliament and the four provincial assemblies. Born in Agra in undivided India in 1940, Hussain and his family migrated during Partition in 1947. He is now a leading businessman of Karachi. Hussain is an old loyalist of Sharif and remained with the PML-N during the regime of former military ruler Pervez Musharraf, who exiled Sharif to Saudi Arabia and created a new party by breaking the PML-N. He served as governor of southern Sindh province for a short period during June-October 1999 and lost the post after Musharraf led a military coup against Sharif.